Why was Edward Klein carrying a gun? It’s been a couple of months since a DuPage County judge ordered Klein — who last May shot an Amtrak conductor as he stood on a Naperville train platform — to be committed to a secure facility in Wisconsin that specializes in treating seniors with dementia. Last fall, the judge ruled that Klein was unfit to stand trial after two doctors reported that he has dementia and a major neuro-cognitive disorder. It is unlikely that Klein’s condition will be cured by medication, the doctors said. We know that Klein, 80, is expected to be confined to that residence space for the rest of his days. We also know that his victim, Homewood resident Michael Case, has mostly recovered from his wounds, which required multiple surgeries and months of recovery. Case told the H-F Chronicle in January that he is looking forward to moving on with his life. But I am still wondering about why this happened in the first place. And why Klein was carrying the .38-caliber revolver that he used in the shooting. Americans are once again talking about guns, and how to protect the innocent and vulnerable from horrific episodes like the mass murder at the Parkland, Florida, high school on Feb. 14. Young people, to their credit, are at the forefront of this movement, which appears to be spreading all around the country. 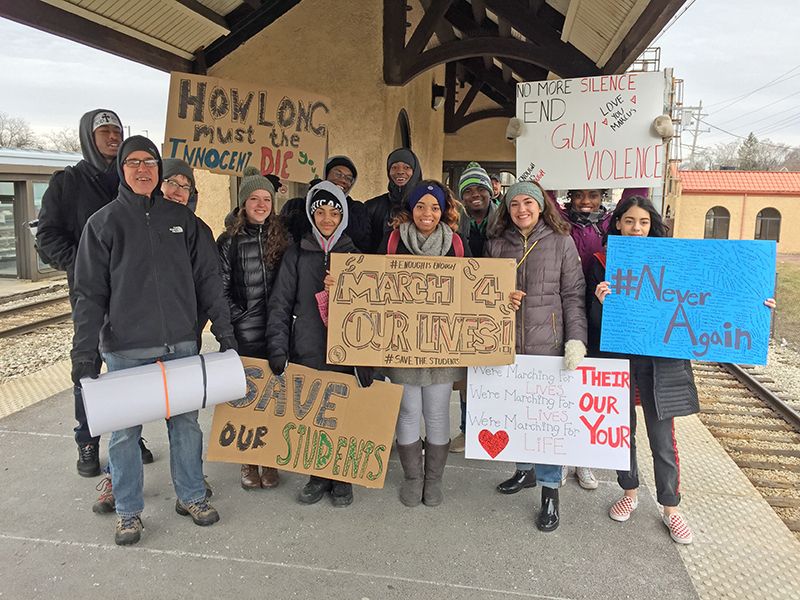 Students at Homewood-Flossmoor High School took part in a 17-minute walkout on March 14, a national event, and sent a signal that gun violence is no longer acceptable and needs to be stopped. We have, sadly, become accustomed to mass shootings in our country — in Orlando, Las Vegas, Suherland Springs, Texas, and too many other places to name. We are largely numb as these types of events unfold. We have been told time and again that the only way to stop a bad guy with a gun is with a good guy with a gun. Except for one thing. That strategy doesn’t actually seem to prevent gun violence. I can’t see any way that a good guy with a gun would have stopped Edward Klein from shooting Michael Case. According to published reports, Klein was unhappy with his assisted living facility in West Allis, Wisconsin, and decided to visit a friend in Las Vegas. So he left the facility and boarded an Amtrak train to take him west. At this point, you may be asking, “You’re allowed to have a gun in an assisted living facility?” But I’ll continue. Klein reportedly told a conductor last May 15 that he no longer wanted to go to Las Vegas. He became upset when told he could not get off the train until Kansas City, where he could get a return ticket to Milwaukee, and then go back to West Allis. DuPage County prosecutors said Klein caused a disturbance at the Kansas City train station and Amtrak officials made provisions to meet him at Chicago’s Union Station and assist him in getting back to Milwaukee. On May 16, the train made a scheduled stop in Naperville and Klein reportedly became argumentative and tried to get out of his car. Klein was reportedly “enraged.” Case was aware of the plan to assist Klein at Union Station and closed the train doors, prosecutors said. According to prosecutors, that was when Klein reached out an open window and shot Case once in the abdomen. He was restrained by fellow passengers. Read that line a couple of times and then go back to my original question. Why was Edward Klein carrying a gun? The easy answer, of course, is “for protection.” Klein, who formerly served in a branch of the Department of Homeland Security, might have thought he was not safe without a gun. As Americans, we are told that the Second Amendment of the Bill of Rights guarantees the right to bear arms. So that is an easy answer too. Klein was merely exercising his Second Amendment right. The problem is that these are truly not easy questions. Does the Second Amendment countermand the provisions of “life, liberty and the pursuit of happiness” that are described as inalienable rights in the first line of the Declaration of Independence? And what about personal responsibility? Having possession of a deadly weapons carries with it awesome responsibility. Is it right to use that weapon when you are angry and make a snap decision to “blow away” someone who is irritating you? Then there is the matter of reality. It appears that this is an incident in which the man with the gun had no concept of reality at the moment when he chose to use it. I think it can be argued that the mass shooters we’ve seen in recent months — In Las Vegas, Sutherland Springs and Parkland — were all severely out of touch with reality when they committed their crimes. They were equipped with assault-style rifles and, in their version of reality, were going to war against whatever demons were plaguing them. I am writing here about one gun, one shooting and one victim who was severely wounded but, thankfully, did not die. Multiply it thousands of times and you have the questions that are now facing this country. Let’s hope that we can figure them out. One more thing. It has been an extremely hard year for Michael Case, his family and the many people who love and support him. He is a very good man and the last thing I want to do is to make his life more difficult by writing this. We are fortunate to have him in our community and should all wish him a healthy, productive life, and for a very long time.